I'd like to thank Kate so much! 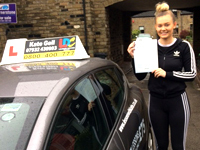 When I've been terrified to get behind the wheel, Kate made me feel at ease and helped me to build my confidence. I would definitely recommend her and, in fact, I already have done! The LD System workbook and DVDs were great and helped both throughout my lessons and while preparing for my test. Thank you, Kate!